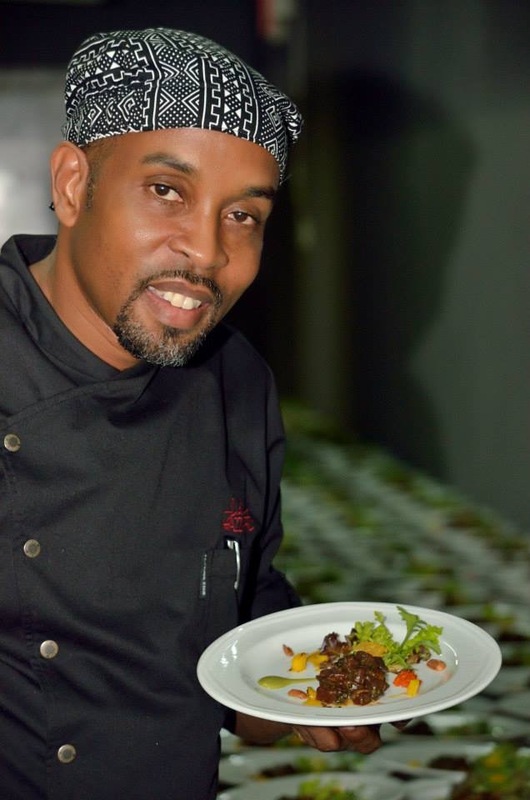 " Influencing Caribbean cuisine " Barbados-based Chef John A Hazzard has keen ambitions to be instrumental in putting Caribbean cuisine on the map and is doing his utmost to make this a reality. "I hope I have some influence on Caribbean cuisine being recognised for its distinct flavours and unique taste from here in Barbados," John says. After having spent several years studying and perfecting his culinary skills overseas, the Caribbean Chef of the Year in 1995 and again in 2004, is now the owner and Executive Chef of John Hazzard Events. Since opening in 2010, John’s business has grown and evolved into a busy, contemporary high-end catering company, centrally located in the parish of St George. Born and raised on the island of Barbados, John studied at Barbados Community College and received a certificate in A Level accounts and an associate’s degree in Hotel Catering and Institutional Operations. "This was where I first became involved in the food world," John says. "I did an internship at the Sandy Lane Hotel when I was attending the Barbados Community College and fell in love with the culinary arts." John then attended the New England Culinary Institute in Vermont, United States, receiving a Bachelor of Food and Beverage Management on completing his studies. His international education continued when he attended Johnson and Wales University in Rhode Island, and completed his master’s degree in Business Administration with a focus in Organisational Leadership. Over the years John has worked at a number of prestigious establishments, including the Savoy Hotel in England, Kunstuben Restaurant in Switzerland, Aureole Restaurant of New York, the former Fairmont Glitter Bay Hotel, as well as Sandy Lane Hotel in Barbados, enhancing his career. It was at Sandy Lane Hotel in his home nation, where John was truly moved and inspired to become a Chef, he says. "Mel Rumbles was the Executive Chef at Sandy Lane Hotel when I started there. "Working with him really motivated me to become a Chef," John says. As a Chef, John has a philosophy of using fresh local ingredients to create dishes with international flair. "My food should be light, clean Caribbean cuisine, no heavy sauces; Caribbean food that reflects the region," he says. Caribbean cuisine is an amazing fusion of African, Creole, Cajun, Amerindian, European, Indian and South Asian, Persian, Arab, Chinese and Indonesian gastronomy. These traditions were brought from many different countries when they came to the Caribbean and in addition, the population has created styles unique to the region. Common ingredients used in many island dishes and which are grown locally include rice, plantains, beans, cassava, cilantro, bell peppers, chickpeas, tomatoes, sweet potato and coconut plus any of the various meats which are available such as beef, pork, poultry and fish. John adds the use of local ingredients is definitely growing more popular and is being promoted by Chefs in the region. "I only use local ingredients in the preparation of my catering for events," he says. These days, the husband and father of two is kept busy with his event catering business, and making guest appearances at various restaurants, hotels and resorts in Barbados and beyond. The region as a whole needs to be proud of its food and work towards promoting Caribbean cuisine for it to become known as a renowned tourist destination, John says. Benefits of using local ingredients are widespread – not only do farmers and local services in the region flourish, but guests at hotels and resorts are satisfied as many desire local food when they travel. Everyone is a winner. With food professionals like John creating beautiful local dishes, there is no doubt that businesses, residents and visitors alike are becoming more aware of what they are eating and where it comes from. As an advocate of using and eating locally, John’s vision of being an influencer on Caribbean cuisine is fast becoming truth. Follow John Hazzard Events HERE.